I'm already anticipating Autumn fashions; my favourite season style-wise and summer never really had a chance in the did it? 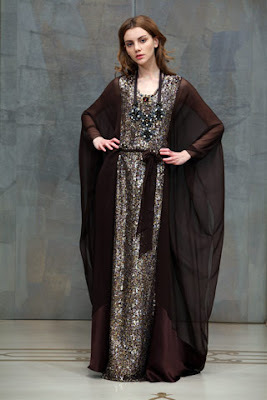 These are some day-to-evening looks from the Pre-Fall 2010 collections - looks promising! Gosh that's what we wear in winter in Australia hehe, for my bday I wore an outfit with a cropped leather jacket similar to the one pictured, but mine has studs on the collar. I wore it with black slim leg pants and a peach coloured ruffled dress/tunic, and a colorful scarf. The maxi dress and jacket combo looks very simple and easy to pull off, definitely gonna give that a go! Ps. Autumn is my fave season too!